The Players: Glee cast (in character: Rachel, Finn, Puck, Mercedes, Kurt, Tina, Artie, Quinn, Sam, Brittany, Mike Chang, Santana, Lauren), guest appearance by Gwyneth Paltrow as Holly Holliday. Song spoilers / set list spoilers after the jump....Read on if you dare! 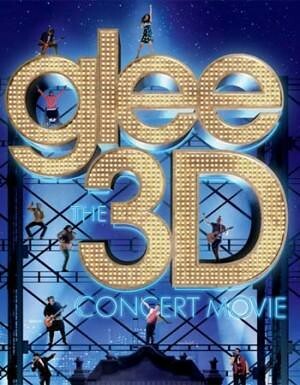 While some may think The Glee 3D Concert Movie is simply a studio move to cash in on the success of the Glee music and merchandising, settling in to watch the film actually offers the audience something else: a really enjoyable movie-going experience. If you're expecting to see a documentary similar to Michael Jackson's This Is It, which obviously offerred a lot of rehearsal and back stage footage, the Glee concert actually gets stuck straight into the thing we've all paid to see: the live performance, and does so brilliantly. Opening with some brief "interviews" with the members of the New Directions in character, the film doesn't bother with introductions to everyone who's performing, or the backstage preparations. Rather, it slides straight into a rousing performance of Don't Stop Believing, then moves swiftly onto My Chemical Romance's Sing, followed by a fantastic version of the Alicia Keys/Jay Z hip hop number Empire State of Mind. Kudos must go to Cory Monteith, Kevin McHale and Mark Salling for their white dude rapping skills - they really do manage to pull it off without too much effort. Interestingly, some of the crowd's biggest cheers went to Heather Morris for her Britney Spears I'm A Slave 4 U routine, Mark Salling for his cover of Fat Bottomed Girls and Amber Reilly, which further illustrates the need for the show writers to start giving them bigger roles, rather than relegating some of their most talented musicians to small background parts and little to no screen time (specifically for Salling and Reilly). Possibly the stand out number of the film is Reilly's absolutely glorious rendition of Aretha Franklin's Ain't No Way, which is a complete show stopper (my only complaint is that they should have put Reilly in a gorgeous, cocktail gown for the number rather than jeans, sneakers and a knitted top). It's somewhat disappointing, though, that the studio opted for a majority of Finn and Rachel solos instead of featuring Jenna Ushkowitz's lovely cover of True Colours, or Reilly and Ushkowitz's punchy version of Florence and The Machine's Dog Days Are Over. It's clear a lot has been cut from the cinema release in favour of small vignettes featuring real life Glee fans who have struggled with various personal difficulties in their young lives. While it's used as a nice tie in to illustrate Glee's overarching themes of self-acceptance, tolerance and morality, I personally would have rather had an extra fifteen or twenty minutes of performances like Single Ladies, Friday, Sweet Caroline, Defying Gravity and Like a Prayer, all of which were part of the 2010 / 2011 concert set lists, if only just to feature the talents of Chris Colfer, Reilly, Salling and Chord Overstreet a little bit more. Also, I think if Glee fans are paying over twenty bucks for a 3D movie ticket, they would rather see two full hours of the entire Glee concert, rather than having upbeat numbers end up on the cutting room floor in favour of stories about people they know nothing about and an edited down 84 minute film that's over far too quickly. Hopefully the DVD release has a lot of the additional songs on it! Some of the flatter numbers included Monteith's cover of Rick Springfield's Jessie's Girl, which really needed back-up dancers since Monteith isn't a dancer and struggled to create the same energy other soloists did effortlessly. Artie's version of Michael Jackson's Pretty Young Thing had the potential to be a much slicker number, but the female back-up dancers were no comparison to Mike Chang's (Harry Shum, Jr) electrifying moves, and Colfer and Lea Michele's medley of Happy Days Are Here Again / Get Happy felt like too much of a meander in the wrong direction in terms of the upbeat tone of the show. It also seems completely pointless to include Lauren Zises (Ashley Fink) in the show, since she doesn't really have any vocal ability and is really only featured in one number. I personally can't wait until she's no longer a part of the cast (since they've gotten rid of Chord Overstreet, an actor with actual musical and vocal talent - WTF, Ryan Murphy?) because I really don't see the value in having a girl there to make a point, but barely feature her at all when singers like Chord sizzle with energy when given the chance to sing and play guitar. But ninety percent of the performances are foot tappingly good, and it's great to see that they've included Blaine (Darren Criss) and a smattering of Warblers for some fantastic numbers (Teenage Dream, Silly Love Songs and Raise Your Glass), and they've even featured the youtube Mini Warbler sensation, who is actually there in the crowd bopping along in his adorable uniform. Besides Amber Reilly's sensational Aretha Franklin cover, stand out numbers include Reilly and Naya Rivera (Santana) doing their fabulous cover of River Deep, Mountain High, Rivera's wonderful tribute to Amy Winehouse in the form of Valerie, and Lady Ga Ga's Born This Way. My only other criticism is that I don't know why they didn't finish with the Journey medley from the final episode of season 1. Starting with Journey pretty much guaranteed they wouldn't be finishing with it, and I think choosing to finish with the lacklustre original song Loser Like Me, followed by an encore of Queen's Somebody To Love seemed like an odd choice, given how successful the Journey covers have been for Glee. Some of the shining moments, though, are when Heather Morris gets to shake her booty. She radiates energy, whether she's front and centre dancing with Harry Shum, Jr, or when she's in the background. Every eye was drawn to her sharp, energetic moves, and I could have quite happily watched a two hour concert of her and Harry Shum, Jr dancing to the Glee songs. Or any songs, for that matter! Overall, this is a really fun flick to go and see. It's heartening to see the camera flashed across the audience where there are teenagers, mothers and fathers with their children, couples, women, men and just people of all ages enjoying the hell out the show. But what really sticks out is how much the cast themselves are enjoying the concert. It's clear they have a real appreciation for their opportunities and clearly enjoying not only performing together, but also watching each other shine. This is definitely a feel good film, and I suggest you check it out before the limited cinema release finished. I loved it and really thought Heather was the star of the show - she features in so many numbers. The mini Warbler was so cute. Yeah, Heather really shone through. Looking at the set list for the actual live concert, Tina is featured a lot more, and I wish they would have had at least one of her numbers in there!